The incredible Par 5 16th at Black Mesa. I enjoy course rankings as much as the next sad, slightly twisted golf addict, and while I’d go along with much of what the course rating panels would have me believe (though, you’ll hate me for saying this, I do consider Pebble Beach somewhat overrated), I think the most important element measuring the worthiness of a golf course – fun - is sometimes forgotten. I’ve never played Pine Valley so probably shouldn’t comment, but is it not slightly incongruous, at a time when we’re trying to downplay how tough golf is, that the course often rated America’s best is also rated one of its most difficult? Most golfers would walk their first round at Pine Valley (okay, first six) with wide-eyes and a sense of awe normally reserved for European cathedrals, but sooner or later they are going to grow tired of being beaten up quite so mercilessly. Don’t get me wrong; in most of life’s pursuits - golf very much included - easy isn’t necessarily fun. We can all hit the driving range from the practice tee but we would never want actual holes to look like that. When a golf course can hold a golfer’s attention for the entire round, however (and long after they’ve left the course), when that golfer is eager to discover what’s round the next dogleg, and when he yearns to return to take on those same holes and same shots again knowing he’ll have fun trying to better his previous score, then you have a great course. Nowhere in America does it for me quite like Black Mesa, half an hour from Santa Fe, N.M. and built on the 57,000-acre Santa Clara pueblo. But how can you possibly say your favorite course is one you’ve played only once? The glorious weather may have influenced your opinion, likewise the fact you played quite well. Your company might have been so convivial, the conversation so downright pleasant, and the jokes so genuinely funny you would have had fun at a $20 muni and left the course singing its praises despite being unable to remember even half a dozen of its dreary holes. 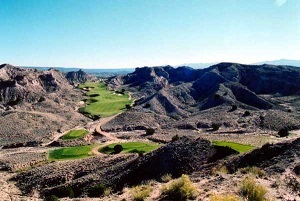 I can’t deny all those things did happen the one and only time I played the beautifully natural Baxter Spann-designed course at the end of Indian Service Road 615, a mile south of Espanola. The sun was shining, my three playing partners could make me laugh even if I had severe toothache, and I do remember playing fairly well - something you see as frequently as Mariners fans at the World Series. But Black Mesa is so stimulating I reckon I would still have fun if it were pouring rain, and my partner, Norman Bates, and I were playing Freddie Krueger and the Grim Reaper for red chile omelets in the Mesa Grill. It's absorbing and exciting and, when owner Eddie Peck decides the time is right, it will be joined by what will no doubt be a similarly intriguing second course, designed by Tom Doak. Until then, 18 holes on the original still costs only $67. $67!!! That’s twice the course at half the price as some places I could mention. Weather permitting, Black Mesa remains open all year. Bellingham is 1,550 miles away. That's a long drive, so pack plenty of snacks.